I am looking forward to next week when I have a Mystery class with Mark Lipinski. My fabrics are nicely starched and cut. Just waiting for the big day. All I know is we are going to have fun with curves! Whip up a springy project for yourself, you will be amazed at how great it feels. I am going to be looking for another one, as a snow storm is approaching! Ahhhh the joys of winter! 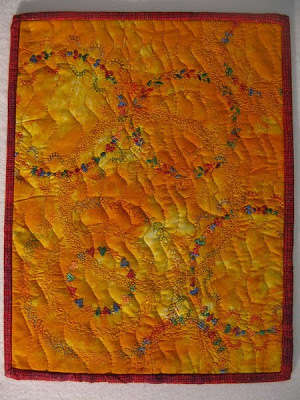 I have been lucky enough to have a little extra time to get back to my online art quilting classes. This one, done with the decorative stitches on my sewing machine was sure fun. If your like me, you tend to ignore all the decorative stitches even though we buy these new machines because all they offer??? This class had us sewing circles with these wonderful stitches. WHAT FUN! And it was so easy, you needed nothing special and definately no extra attachments. I couldn't help, but become captivated watching them stitch out. If you haven't taken advantage of Free Lunch Cafe yet, you really should. It is better yet "free". I don't know about you, but I have an issue with the thin little kitchen towels that we pay way too much for. I recently had a bath towel that after a few washing, the sides started to fray. A quick glance at my basket of extra pieces of quilt binding, made that little internal lightbulb go off. I cut the bath towel into quarters which is approximately the size of a kitchen towel anyway, and bound them with the scraps. Voila! I have the greatest thirstiest towels in my kitchen I have ever had. Better yet, with them being dark they don't get dingy and stained like their counterparts. 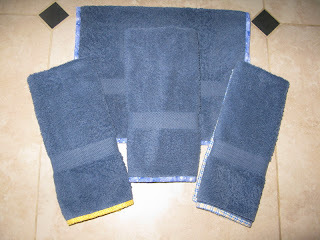 I see at Target that they now carry a towel that they tout as bleachable. They come in a big array of colors, and while I haven't tried them, I am going to pick one up and do a little bleach testing. Those might be a great answer for a kitchen towel. Just thought I had to pass this little tip on to you all. 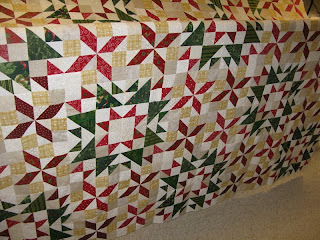 Christmas might be over but I got my mystery quilt top pieced yesterday. 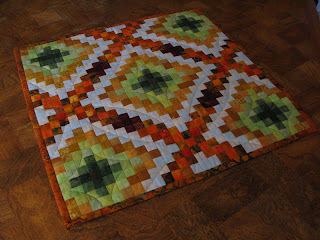 Bonnie Hunter from Quiltville came thru yet again with a great stashbuster quilt. I am finding that mystery quilting is really quite fun. Not having any idea what your finished project will look like really challenges me. I need to make this quilt, quite a bit bigger for my California King size bed, so I am going to do something a little different in the borders. I will keep you posted as to my progress. 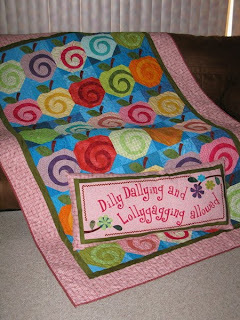 For those of you interested in the pattern I believe that it us only up temporarily on Quiltville.com you best download and save the pattern very soon. There are a couple of other sites with great patterns that are up for a limited time also. First is from Harbour Quilt Company At the bottom of the page is a darling snowman table runner that will only be a free pattern thru the end of January. Make sure you get him before he disappears. Harbour Quilt Company offers a free pattern every month, so make their great website a regular place to visit for fun free patterns. 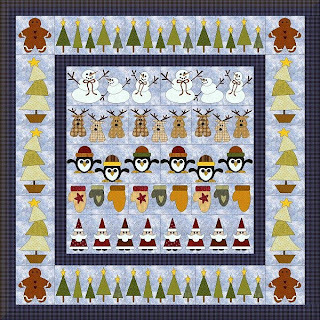 Last but not least is a wonderful new Christmas quilt from Fat Cat Patterns This will be a row of the month quilt. Be sure to download your pattern each month before it is replaced with a new row. It runs now thru August giving you time to have it quilted by next Christmas. This one is just too darn cute to pass up. Check them out! Hope this gives you some inspiration for the new year. The DHL man was knocking on my door the other day and to my surprise was this absolutely stunning Quilt from Lynne in Leicestershire England. When I signed on for this swap, never in my wildest dreams did I think someone would take the hours of painstaking precisions to complete this for little ole me. This incredible "Trip to Ireland" mini quilt is 19" square and comprised of all 1" squares. I decided to make an inchie quilt one time and it is still in a bag somewhere among my UFO's. Lynne wrote and told me she was very mathmetical minded and likes working out her own designs. I bow down to you Lynne. I wish I had that in me. I have to see something to make it happen, while I have done some playing, it is out of my comfort zone for sure. 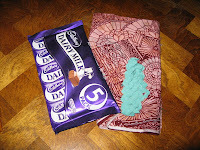 If things could get any better, she also included these little treasures with my quilt. I have new fabric and trim to play with and a package of inspiration to help me along the way. LIFE IS GOOD! Thanks so much Lynne, I will treasure this for many years to come. For any of you, who have considered swapping online, my advise is to go for it. I have made some wonderful new friends, and the inspiration you get from a new view on quilting can't be beat! Oh yeah, and for my quilt, it will be on it's way to my partner across the globe today. Hope she is half as happy with it as I am with mine! With a new year starting I am looking to learn some new techniques. This is a little sampler that I did with paper fabric. The base is a muslin with tissue paper on top. Threads and colored tissue paper in between the layers give it a dimensional look. Fabric paints were then used to give it color. It was a very interesting process that proved to be a lot of fun. For those who aren't afraid to try playing, there is a great website. http://www.free-lunch-cafe.com/ You can sign up for classes monthly. Check it out, I think you will be pleasantly surprised.